"Roasted vegetables and polenta layer together with Italian-seasoned Veggie Ground Round and cheese in a not-so-traditional vegetarian lasagna." Thaw vegetables and chop into small pieces. Set aside. In a large bowl, mix together egg, ricotta, 1/2 cup (125 mL) of the Parmesan cheese and basil. Season with salt and pepper. Set aside. Cut polenta into 1/4-inch (0.5 cm) slices. Set aside. Lightly grease 13 x 9-inch (33 x 23 cm) baking pan with oil. Spread 1-1/2 cups (375 mL) of the pasta sauce onto the bottom. Arrange a layer of polenta over sauce. Spread half of the roasted vegetable mixture over polenta. In a large bowl, mix together remaining sauce and veggie ground round. Spread half of the veggie sauce over vegetables. Spread ricotta mixture carefully over vegetables. Sprinkle with 1 cup (250 mL) of the mozzarella. Add another layer of polenta (you may have some left over). Add remaining roasted vegetables, then remaining pasta sauce. Top with remaining 1/4 cup (50 mL) Parmesan and remaining 1 cup (25 mL) mozzarella. Cover loosely with foil. Bake in the preheated oven for 20 minutes; remove foil and bake 20 minutes longer or until bubbly. Let stand for 10 minutes before serving. 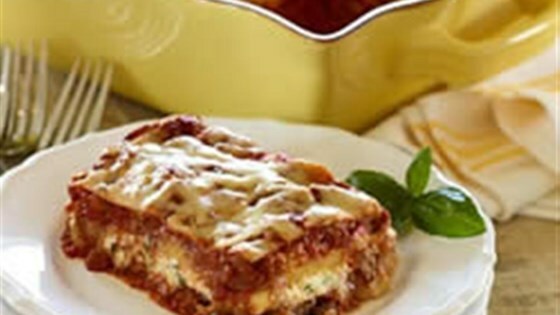 See how to make a cheesy, saucy vegetarian lasagna that’s loaded with veggies. For more vegetables, use Primavera or mushroom sauce. Leave out ricotta layer, use vegan Parmesan and mozzarella shreds.